NASA Probe Takes First-Ever Close-Up Images Of Jupiter's North Pole : The Two-Way "It's bluer in color up there than other parts of the planet, and there are a lot of storms," a Juno mission leader says of the gas giant's northern reaches. 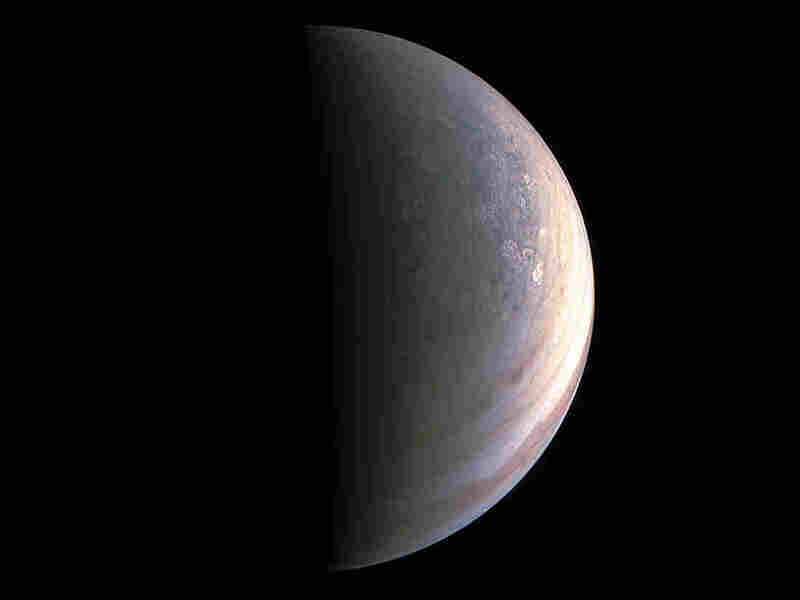 NASA's Juno spacecraft captured this view on Aug. 27 as it closed in on Jupiter's north pole, about two hours before the probe's nearest approach. NASA has released the first close-up images ever taken of Jupiter's north pole. They were photographed by the Juno spacecraft now in orbit around the gas giant. The north pole looks totally different from the rest of the planet. "It's bluer in color up there than other parts of the planet, and there are a lot of storms," Scott Bolton, principal investigator of Juno from the Southwest Research Institute, says in a NASA statement on Friday. "This image is hardly recognizable as Jupiter," he says. "We're seeing signs that the clouds have shadows, possibly indicating that the clouds are at a higher altitude than other features." 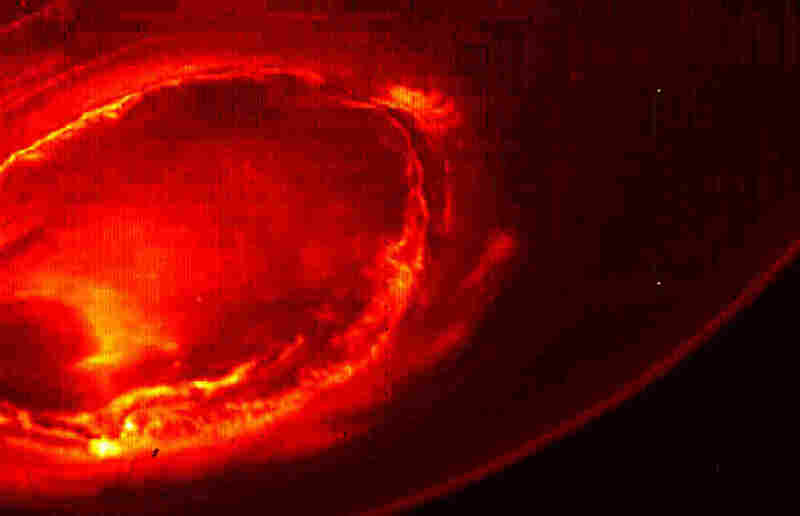 NASA also released an image of Jupiter's southern aurora, a unique view that could be captured only by a spacecraft close to Jupiter. The aurora occurs when energized particles from the sun interact with Jupiter's atmosphere near the planet's poles. The space agency also released audio of what the aurora sounds like if you convert it to a frequency the human ear can hear. The pictures and data were collected Aug. 27, when Juno made the first of some three dozen scheduled close encounters with Jupiter. At its closest approach, the spacecraft was a mere 2,500 miles above the planet's cloud tops. Juno arrived at Jupiter on July 4. But its orbits are unusual. The probe flies near the planet for only a few hours at a time, spending the vast majority of each orbit far away from Jupiter. That's because of the harsh radiation environment close to the planet — harsh enough to fry Juno's electronics if it hangs around too long. But it's during those close-ups that Juno can get the most detailed view of Jupiter: what its magnetic and gravitational fields are like, whether it has a solid core, how much water there might be hiding beneath the cloud tops — the kind of information planetary scientists are most eager to get. Juno is supposed to make 35 more flybys before the mission ends in 2018. Right now, the probe is in an orbit that takes some 53 days to make a single revolution. Ultimately, that will be cut to 14 days. But the bottom line is it will take some months before Juno can compile the clear picture of Jupiter that it was sent to get.